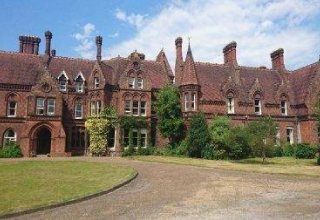 Set in 12 acres of beautiful grounds and woodland just outside Ware in Hertfordshire, Easneye house is a fine example of a mid- Victorian Gothic style stately home. As well as a large and comfortable student common room, students can enjoy relaxing on the lawn, play sports and use the large football field for group activities. All Nations College offers a number of meal choices that are locally sourced and homemade on site, and can cater for most dietary requirements with prior notice (taken at time of booking). There is also a snack shop onsite selling sweets, drinks and savoury snacks. For residential students, accommodation is provided in comfortable bedrooms, with single occupancy option. Staff remain on site 24hrs per day to ensure student well being and safety. Facilities available include a common room with television/ dvd player as well as spacious grounds for relaxation in the evening and at break times. Free WIFI is available. Staff organise a full leisure programme and group activities for students in the evening, such as basketball, rounders or fun quiz nights. For specific subject availability, please call us on 01727 744340 or email us. ADDRESS: All Nations Christian College, Easneye, Stanstead Abbotts, SG12 8LX. Stanstead St Margarets’s station is a 10 minute taxi ride (2 miles) from All Nations College, and is on a direct route to London Liverpool Street. Travelling clockwise Take Junction 25 (A10 Cambridge/Enfield/Hertford) Follow the A10 northbound for approximately 7 miles. Take the turn off the A10 marked A414 Harlow/Chelmsford/Ware (South), and follow A414 signs to large roundabout with several turnings off. At this roundabout, take the B181 to Stanstead Abbotts. Go straight through the village over the railway (passing St Margaret’s station on your left). Travelling anti-clockwise – Take Junction 27 for the M11 North and follow the directions above. The drive to All Nations College is signposted. The drive is about ½ mile (0.8km) long uphill until you reach the main house, Easneye, at the top of the drive with the large car park. Follow the signs which say Reception. All Nations is 35 minutes from Stanstead Airport, 45 minutes from Luton Airport and 55 minutes from Heathrow Airport.